This isn’t the usual mix of descriptors one finds in music of this kind, and it’s gratifying to find that none of them are mere hype. 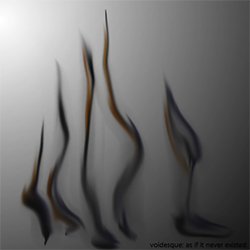 Under his nom de guerre voidesque, Jeppsen’s first EP, as if it never existed, makes a very striking first impression. The three artists mentioned above exert themselves on Jeppsen’s music too (which he freely admits), but less as an éminence grise than as a collection of influential but nevertheless distant forces. Another way of putting it would be to say that these inspirations act as a series of points of departure in Jeppsen’s music rather than dictating both the style and idea of the journey. 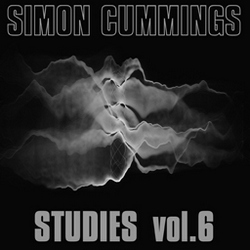 Right from the opening track, ‘synaptic luck’, there are potent signs of individuality, in both the unexpectedly warm acoustic (which persists throughout) and the flexibility of the tempi, seamlessly shifting the underscore and making the beats interesting in their own right, emancipating them from being mere markers in a grid-like space. They turn out to be the focus of the piece, in fact, whereas at the start it was the various melodic ideas that seemed to offer most interest; it’s rather satisfying to have one’s initial sense of perspective proved to be otherwise. 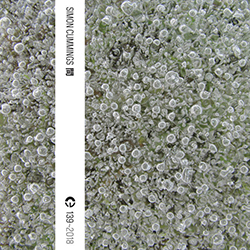 A similar atmosphere pervades in ‘the imaginary restitution’, a track that also places most emphasis on the beat structures while nicely confounding exactly what they are, while in ‘eusodius’ the beats become a remarkable, restless lattice that becomes increasingly hypnotic; it’s a brave composer who aspires to the intricate rhythmic evolutions of Autechre’s Untilted, but this track carries it off with real aplomb. It’s only fair to say that the EP’s longest track, ‘new threats’, is an aspiration too far; it opens interestingly enough, but is ultimately too monotonous to sustain its almost 10-minute duration. But that’s the odd one out, and the remaining three tracks are each outstanding. ‘wrong door’, despite lasting a mere 106 seconds, inhabits the kind of cracked texture that Three Trapped Tigers might create in their gentler moments, and ‘masquerade’ is a beautiful exercise in understated aggression, carrying along a crude melody covered in razor barbs, contorted and cut-up by the beats, which in this context, despite their force, take a secondary role. Like ‘wrong door’, ‘masquerade’ impresses in part due to its brevity; one can’t help wanting to hear Jeppsen turn these textures into larger canvases, but as miniatures they’re no less superb. Yet it’s the final track, ‘previous’, that stands out most, a disarming introduction—a quiet ambient melody, sans beats—swiftly becoming a dialogue between naïve, playful melodic shapes and gritty, out-of-step rhythms. It’s a delight, the ear dancing back and forth between the two strands which, by design, can never quite coalesce. There’s much to praise in this first voidesque release, which is a strikingly individual take on what would once have been called IDM. Jeppsen’s clearly a talent to look out for in the future. as if it never existed can be streamed below, and purchased from the voidesque Bandcamp site; new voidesque material can be heard via Soundcloud.